Starting about 550m north of Bewsey Lock, and for almost 1km (1/2 mile), the Sankey Brook has been diverted to run along the St Helens Canal. Don’t let the name “Brook” fool you into thinking this is a little trickle as it can have a substantial flow. That doesn’t directly stop navigation but the Sankey Brook is liable to flooding and, in the floods of December 2015, the water levels overtopped the embankments through here and was brushing the underside of the bridge. The level of the brook sets the water levels from the top of Bewsey Lock to the foot of Hulme Lock. 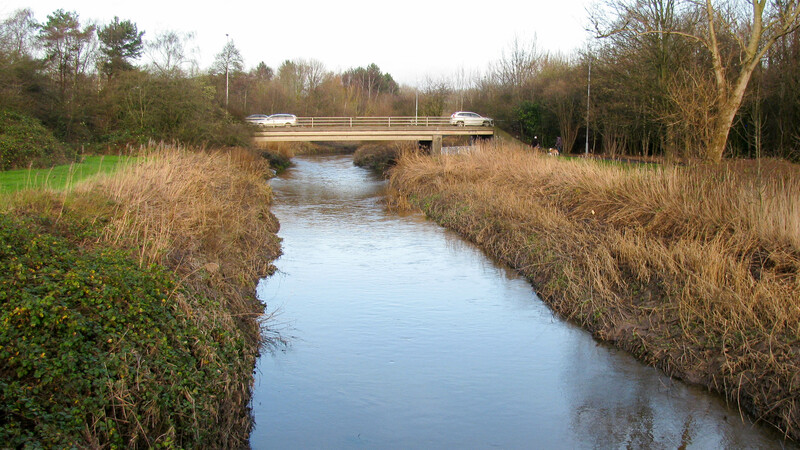 The Sankey Brook flows in from the west and out to the east so the flow must cross the canal somehow. When built, the brook crossed the canal on the level, just below Hulme Lock, rather like the River Cherwell crossing the Oxford Canal at Aynho Weir Lock. This length of the restored canal is unlikely to be navigable after very heavy rain.